1. Why Stefanie quit her 6-figure consulting job to start her own business and how her first attempts failed miserably. 2. How Stefanie picked her niche based on a hunch from her own life experience. 4. 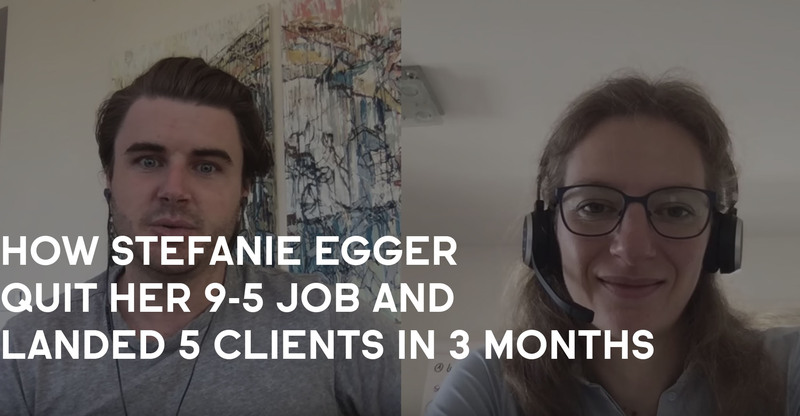 How Stefanie landed her first 5 clients using a combination of Linkedin and direct outreach emails. 6. Why the combination of: Niche x Offer = Result, mindset and the sales script is the ultimate weapon for success. Sam Ovens:	Hey, everyone, it's Sam Ovens here, and today I've got Stephanie Egger, who is one of our Consulting Accelerator customers. Stephanie has got an awesome story. She was a professional business consultant, working in firms for quite a long time. Then, she decided to quit her job, and go into business for herself, and start her own consulting business. Through the Consulting Accelerator program, Stephanie's been able to find her niche, which is helping female business consultants. She helps them to succeed at a higher level, and to really grow through mastering their mindset, and their business relationships. Stephanie's been able to get five clients so far, and we're gonna dig into her story, and see exactly how that all happened. How's it going Stephanie? Stephanie Egger:	Very good thank you. You, Sam? Sam Ovens:	Good thanks. You're from Switzerland, right? Stephanie Egger:	No, I'm originally German, but based in Switzerland. Sam Ovens:	You're based in Switzerland, awesome. Stephanie Egger:	It's all the same, in the Alps originally. Sam Ovens:	Cool. Why don't you start off by telling us what was life like before you joined the program? What was going on then? Stephanie Egger:	I joined the program end of January this year, so just a couple of months ago. I decided to quit my job already before I have heard about the programs. I resigned for end of, the beginning of November 2017, and thought I would have been perfectly equipped with everything I need. I knew a lot about sales, I knew about mindset before already. I knew about how business is working. But, it didn't really come to really shooting off as I wanted to have it. I always was looking for something, which gave me the connection between all of the capacities I had, which I grew during my business time as a consultant, but also being a business coach. I had everything I needed, including sales training. But, it didn't really manage to bring it together end to end. Then the Consulting Accelerator showed up, and things have changed a lot ever since. Sam Ovens:	Why did you want to quit your job, first of all? Stephanie Egger:	I believe that on the one side, I'm like a born entrepreneur. My parents are entrepreneurs themselves. In business consulting, when you're working in the traditional way, the exchanging money for time, and working and working with client engagements, you just start to, at the end, questioning yourself. Your day only has 24 hours, so how will it be possible if you just earn more money? I earned six figures already, so it's not like I wasn't successful. But, it was always this hunger to really make a change in people's lives, and to really bring value to other people. I couldn't really do that in the way I was wishing, the longer I was working. Therefore, it was the key position to, now, I'm doing it really on my own. Sam Ovens:	Cool, and so when you quit, and you thought, you must have thought, all right, I'm gonna start my own business, and when you went to do that, before you had joined the program. You said, you had lots of skills in lots of different areas, but you couldn't connect all of the dots. What was the real, where did you keep breaking down with that? What was the thing that, what was the crux of that? Stephanie Egger:	I think the crux was, I've been self employed already before, for three years, and there we had the great capacity that we had, really a bunch of money, so we though, we invested everything in CI, corporate identity, and beautiful business cards, and a beautiful website, and a beautiful mobile office, and really everything. But, at that time, we never really figured how sales is working. We were just like, running around with selling our service for 20 bucks or something. Then, I thought last year in November, I learned that lesson, so I'm doing it totally different. It was like this was the one part of the wave, and I know something totally different way of the wave. I think my problem was that I was not persistent enough. I haven't understood this way of variation, and really just his number crunching thing of sales. I didn't get that. For me, it was like, when I'm calling 10 people, then I need to get a 10% closing rate, or 20%, so when I call 10 people I will have two sales. This is just ridiculous. Of course, it can happen easily, but with this understanding of it's really a coagulated numbers game, that the more you put in your funnel, the more you get out of it. If a proven and tracked process, this is what really at the end, made a really big change for me. To understand it from that perspective. Sam Ovens:	Got it. You joined the program, how did you find it, first of all? Stephanie Egger:	I got a Facebook ad. Sam Ovens:	That's how most people get it. Stephanie Egger:	Yeah, exactly, and had a couple of people who I appreciate a lot, and who are really successful in the business, who liked the pitch. Then, I thought okay, I think it was just like between Christmas and New Years Eve, that I was observing the webinar. I said, holy crap, okay, I need to, really to get that. But, then I was traveling for three weeks to India for a meditation retreat. Therefore, I thought, okay, I come back and then I do it. It was really already, what I took out of this webinar was eye opening. It was for me, really just okay, I got it totally wrong. First of all, you answered my question on business consulting, and that it should work in a totally different way. Secondly, I understood that almost everything is possible to offer as a service, so scalable in online training, or whatever. Until then, I thought coaching could never be sold as online training. There, a total change in my mindset. Plus, the way you presented the webinar was like, okay, this guy really, really, really knows what he's talking about business consulting. I've been in that niche for 12 years, so I've seen really a lot, and I thought, holy crap, he knows that bloody day better than me. Sam Ovens:	Cool. You joined, and then what was the process like then, after you joined? Stephanie Egger:	Well, I joined the end of January, and it took me, I think, two and half weeks to get through everything to come to week four. Yeah, then I started to do a lot of this list building, and everything. Getting in touch with people, and starting to create my direct outreach lists, and ordering my [inaudible 00:07:29]. Sam Ovens:	Well, let's go to you niche first of all, because that's, when you joined the program, did you know what you were gonna do? Did you know what you were gonna offer, and who you were gonna help? Stephanie Egger:	My niche was broader at that time. Because, at that time I thought, I want to help female business consultants and coaches, to grow their business with empowered mindset, and the business relationships. But, over time, and especially when speaking with the female coaches, I just figured, uh-uh, I definitely don't want to work with them. The more I spoke with people from the business, the more I got into it, and I also figured that, especially this coaches women were pretty resistant to me. They were no so open to answer my questions, or to answer my emails. I did all of my direct outreach at the beginning by email. Then I thought, you know what, I'm so fed up with you. Now, I'm gonna ask the men what they think about the women in business. I sent out, with my direct outreach, I sent out 120 emails to random business consultants in Switzerland, or owners, or something, so I just did everything via LinkedIn. From these 120 I think I got like 35 or 40 phone interview possibilities with these guys. Because, this was something what was really triggering them. Because, they said as well, yeah, I would love to have more women in my business as a consultant, but somewhere I can't find them, or they're making themselves so smaller, that they can't really unleash their potential. There was really a need for that, what you are doing. By stepping out of my initial idea of, I will help women, and therefore I will only speak with women in my niche. I went to the men to understand more their perspective, and to learn there, a lot more about my niche. Because, then I saw the program from both perspectives. This, I could directly switch into an official business consulting survey, which has sold that as a keynote. That's a pretty cool thing. I would have never thought about that before. This just happened, ever since it's running on. Sam Ovens:	You chose the niche, female business consultants, because you were a female business consultant. Stephanie Egger:	Yeah. Sam Ovens:	There was a hunch there that, other people would be like you, right? Stephanie Egger:	Yeah. Sam Ovens:	That was probably the initial thing that sparked it. Stephanie Egger:	Yeah. Sam Ovens:	Then, you started doing direct outreach, and research, and all of that, and what did you really identify their big problem to be? Stephanie Egger:	The big problem is that women, especially in male dominated, and very result driven environments, tend to self sabotage themselves much more than men do. But, since all of these structures, and procedures and everything, they're pretty much male made. What most of the time when you have a successful woman in a business consultancy, they have more man 2.0 than really a woman who is successful. More, she has adapted more to the male habits, and is playing a pretty good role, than really to create sustainable added value being a woman, and putting their supplement capacities into account. This is what I really want. I want to help clients, and companies, and the people to create more value. This is why I'm on the business consulting woman. Because, when they're in the consultancy for the next three to four years, and then they really start suffering, and getting frustrated. Then they resign their job. It's like everybody's losing. Sam Ovens:	What are the men, because you said there's the man structure, and for a female to really do well in that, she has to pretty much become a man. She's still a woman, but she's got, she's behaving like a man. What does that mean? How do men differ from a woman exactly? Stephanie Egger:	In that particular case, it is like pretty focused on these games, these hierarchy things what men are playing. These really still this, more like you have a super alpha who's running, and then everybody's just running behind, and nobody's really carrying about the team, and how people are feeling. But, results are the most important part. Also, when it comes to negotiating with clients, everything is like the emotional part, and this caring part, what women natural bring it to your relationship, is somehow missing. When, as a woman, you're not strong enough to say, hey, but I can add a value of that. They will just cope with what is there, and then there is value lost. Sam Ovens:	Got it. You found this was a widespread problem across all female business consultants, and that's [crosstalk 00:12:53] It's really cool what you did, by talking to the males to get their opinions on the females. Because, quite often, someone can't identify everything accurately about themself. You need to get an external observer. Stephanie Egger:	Exactly. Sam Ovens:	That's really smart. Stephanie Egger:	I learned a lot when I spoke with them. Because, they said, for example, women have one of these core beliefs that they think they have to work more to be taken equal in the work results as man. I could have a belief that I think I need to work 60 hour to be recognized in the same way like a man who's working 40 hours. I was the same, and then one guy told me that, yeah, but you know, that is really annoying when you have someone, a woman like this in your team. Because, you and your buddy at work, you want maybe to just have an after work drink, or something at 7:00 PM, and that you know that this bloody girl is still sitting for another two hours in the business hustling. You either can't really enjoy your beer. I said, holy crap, I haven't seen it from that perspective. That was a big learning, and another big learning was that, women normally do observe a lot what people doing around them. Out of this care and respect of they recognize when someone is doing an extra mile. When they're doing a pretty big [inaudible 00:14:16] Women do expect that, when they do that, that their leader is recognizing this as well. But, most of the time, the leaders are men, and men don't really do this caring thing. They're not really observing what's going on around them, but they are pretty much focused on themselves. When you have a woman who is not speaking up for what they have reached, because they believe that their leaders should be able to see it, and the leader is a man, who is totally in thought with himself, there will be a double vicious circle going down. Because, the woman becomes frustrated, because nobody is recognizing her, and the men is not even recognizing that there is something going wrong, because he believes that when she wants something, she will come and show up at him anyway. I haven't seen that- Sam Ovens:	That sounds like my relationship. Stephanie Egger:	Well, then that's the key. Sam Ovens:	Cool, so you found the problem, which is an interesting one. What other members of the community can learn from this is, that when you're doing your market research, I tell everyone to talk to the market. Find out what their problems are, what they want, and everything. But, what I've never thought of before, and what you thought of was, not only talk to them, but talk to people who know them. Because, that way you can get their perspective on them. You're still researching them, but through a proxy. Stephanie Egger:	Exactly. Sam Ovens:	Which is, that's really smart. You found the problem, and then how did you know that you were gonna be able to solve this problem? Stephanie Egger:	A lot kicked into your mindset part of your program. Because, I did, I started self development and everything six years ago. I have been already working as a coach. Nevertheless, I was struggling with all of this bloody stuff. One of the key messages was, it doesn't matter what is true, only what you believe is true, because with work this will become true. This is one of the key sentences. Therefore, since I have always been pretty good in talking with people, and bringing people forward, and having them, solving their problems, it's a natural thing for me to do that. It's like a gift, and over the 12 years career I had, there were always people coming to me and saying, hey, I have struggles with this leaders, what should I do, or I'm struggling here, and struggling there. Whatever they manage to put into account, or just to realize what I said to them, yeah, it just got better. It was a good thing for me, and therefore, I know that I can help them. Sam Ovens:	Cool, so you took the mindset training yourself, and that helped you a lot, and so you thought, okay, so this is probably something that can help the rest of this market too. Stephanie Egger:	Exactly. Maybe not one on one copied what you are doing, but really adapted to them what a couple of concepts have really opened my eyes there with. Well, I haven't seen it in that particular way, and I am able to observe what it's doing with me. Like the affirmations, or this continuous, repetitive 30 days habit of change note tracker. I never thought of just taking notes on my personal progress, because I'm normally waking up with a blank brain, no matter what achievement I did the day before, as soon as I sleep it's like, everything is gone, and my paper is blank again for the next day. This makes, sometimes, a big frustration. Sam Ovens:	People are delusional about how good their memory actually is. Stephanie Egger:	Yeah, and therefore, only this thing to just track down what I did, what I just could tick off. My list helped me a lot to realize that I have changed a lot, and also that I was still at the beginning of the training. I was still scared of doing cold calls with people, or even just sending out an email. I was like, can I really do that? Now, I'm sending out emails to really everybody, and talking to everybody, and feeling pretty cool no matter what's coming back. Even, I had a couple of really tough answers. I always found a way to turn it in a way that at the end it was a positive outcome, that was pretty cool. Sam Ovens:	What would happen before? Before you worked on your mindset stuff, were you just frozen, paralyzed, you couldn't even send things out, or- Stephanie Egger:	Yep. Sam Ovens:	What were you coming up against? Why could you not do that? Stephanie Egger:	I think on the one part, I didn't allow myself to be successful. I had a really big concept to, I don't know if I'm allowed to be, and also these things when you make yourself, and you self sabotaging yourself like you could succeed. Being afraid of, oh my God, it really could happen. Yeah, and then when from your true self, and then when all of this concept thing is taking over, and is washing you away somewhere, and then you're there. Coming again, and again. For me, the affirmations help really a lot. Sam Ovens:	You said you didn't feel like you could succeed, or like you weren't allowed to. Stephanie Egger:	Exactly. Sam Ovens:	Who's imposing that rule on you? Stephanie Egger:	In my understanding of how the world is working, which is a little bit like you do understand the world. It's like there is, I believe, that there is 95% of what we believe is like a concept of society. That society has specific beliefs, and you just adapted to them, because you were born into it. But, you need yourself to decide that you want to change that. Then, you need a couple of techniques to let these concepts go. It took me a while to just figure out of that. These constant conscious decisions to, I want to change my life, because I want to achieve this, this, and this. The first step is to read my affirmations every day. To really break that down, those have worked. Sam Ovens:	Got it. You've got your niche, you thought, I'm gonna help them with this mindset, and personal relationships, and business relationships, and you've had success with this yourself. Obviously, there was some confidence there, because you'd seen it work with you, so pretty confident it's gonna work for somebody else. Stephanie Egger:	Yep. Sam Ovens:	How did you get your first client? Stephanie Egger:	As a referral from someone who answered on one of my direct outreach emails, that she's not interested in what I'm offering. Sam Ovens:	You sent a direct outreach email to this person, and then what did they say back? Stephanie Egger:	She said that she is not really interested, or she doesn't really need what I'm offering her. Because, she is like for years already in her business. Then I wrote back and said, hey, I really appreciate her dealing with her business relationships in this way, that she answered to me. Therefore, I believe her that she's really a pretty good business consultant. Then, a couple of weeks later I got a note from someone that said, hey, I'm here, and I've got a referral from this person, and she said I might talk to you. My second client, I got on the same way. I had a phone call with this person, and also she was like, we had a pretty nice discussion, and we figured that okay, I don't really, I can't help her with anything, but we had a great discussion on her business approach. She helped me getting into this keynote thing. It's really direct outreach is not only to reach your perspective clients, but it's also to grow your network, and to make people be aware of what you are doing. The better you have, find your niche and your offer, the easier it is for your referral partners to think about you in the right moments. Sam Ovens:	Got it. That's how you got your first one, and then how did the second one happen? Stephanie Egger:	The second one happened just by, I sent her an email, direct outreach. I said, I'm on vacation, can we can talk a little bit later? Then we spoke about it, and then we had a pretty nice chat, and I even didn't think of this could be something like a strategy call. We were just talking, and talking, and I told her what I'm doing. Then, she said, yeah, I really could need that. I said, oh, okay. Then I just did the closing questions like, shall I tell you how I could figure out this for you, how it could work for you? Then, I just told her, and she said, I really need to have that. Heaven sent you to me. I stated my offer as I have it in my sales script, and then she said yeah. But, this is really totally off budget for me. I said, okay, but I really want to work with you. She said, yeah, but I also really want to work with you. We had a pretty good time on the phone. I said, you know what, I normally don't do that, but I could offer you a one-on-one coaching, and we just charge that per hour for 385 Swiss francs, and she said yes without even hesitating. Sam Ovens:	What was the first price you stated to her, that she said was out of budget? Stephanie Egger:	I stated the six weeks program for also repositioning her and finding really her position as a business consultant for like 6,500, so knocking it down from 9,800 to 6,500. Then she said, that's just off budget for her right now. Because, she has any story. Then I thought okay, if I can't get her that way, I just tried in a way to, with really a ridiculous price on it, and she said yes. Sam Ovens:	Cool. What made you want to go to the hourly pricing? Stephanie Egger:	Because, I knew that I wouldn't get her in another way. Sam Ovens:	Why did you want to get her? Stephanie Egger:	Because, I could, I don't know if you know that feeling when you have a connection with someone, directly when you speak with someone, and you feel that you could together, you really could create value together. That happened, and therefore, of course I could have said, okay, then it's just not a good fit. But, since I was so used to working on hourly rates, and for this rate, it's fine for me to do it, so I said okay, go for that and see what's happening. Then, when she has sorted out her financial situation, we still can go on the six weeks program intensive, shooting her up and everything. For me, it was like, a decision if I want to get a foot in the door to get someone who will be able to really give me testimonials, and with whom I can already check whatever is going on, and if I really can bring her forward for a price that's also fine. Even though, it's not what I wanted at the beginning. But, this is also part of being a consultant. That you take what your customer is giving you, and then you try to make the best out of it. Sam Ovens:	Got it. I think it's, on your first few clients you can make concessions, because you just need to start working with people. Stephanie Egger:	Exactly. Sam Ovens:	Then, you're gonna get better, you're gonna get more confident, and all of that stuff's gonna happen. For people listening to this, other members, you can make some concessions on the first few clients. Because, it'll boost your confidence, get testimonials, and things like that. That was your, that's how you got your second one. Why don't we dig into how you were doing direct outreach, because it seems to have worked for you. How were you, first of all, finding the people to email? Stephanie Egger:	I did a LinkedIn research, and figured out pretty fast that LinkedIn is limiting you in a pretty strict way, when you're doing a specific search algorithm too often. Yeah, I was just looking for my niche on LinkedIn searches. Then, I upgraded for a month or two, to this, it was HR recruiter thing to really get a deep dive. Then I was clicking on the website, and was getting the direct email from the person. Then, I emailed them first, and a couple of days later, if I didn't get a direct interaction with them, I added them on LinkedIn. Maybe you have seen my email already, I just want to keep in touch with you. Then, if there still wasn't anything a couple of days later, I sent out another email like, when they have accepted my LinkedIn, but there was still nothing. I was like, hey, thank you for accepting me on LinkedIn. How can we proceed? What can I do for you, maybe we can talk, or something like that. Then, I had a server when they still didn't interact with myself, so three weeks after that, I thought, okay, I want to get feedback. I really want to know why they are not answering me. I sent them an email like, the subject first name, your feedback is requested. Then I stated, hey, sometime ago I sent you an email with an offer, and obviously this didn't really reach your interest, and since I really want to try to take into account what my market is wanting, and feedback, especially from customers who are not buying from myself, it's really valuable for me. Because, this makes me grow, and makes my offer better. Would you like to just tell me why my offer has not met your request, or your needs, and sent that out. I got like 20 emails back from women who said, oh my God, I didn't have time to answer it, but I really like the way you're sending emails, or yeah, because I thought that it's pretty arrogant the way you're doing it, and you really pissed me off. I said, yeah, but at least I got an interaction out of it. It was like a big scale of what came back. This gave me, again, a good point on how my website, what people think about my website, how people think about my emails, and all of this. Because, this is then a knowledge I can bring to my customers again, when they do also direct outreach emails to their clients. That I can say, hey, this works. This worked for me, this template. This didn't really work, and this could work in a specific way. As soon as I switched from taking it personal to, it's a market research again, on the way how people do react to direct outreach messages. Then, it got really a lot of fun, and just almost a game to see what kind of email I can write, and how are the opening rates, and are they answering or not, and then also if yes, where you see how often they are opening your emails. Then you just shoot an email afterwards, and it's a really cool thing, so I started really liking direct outreach email. Sam Ovens:	What you really did was, iterated your process a lot. Stephanie Egger:	Yeah. Sam Ovens:	You didn't just stick to one rigid email, which you just sent, and were like, oh, this thing isn't working. When it didn't work, you asked why, found out why [crosstalk 00:31:16] made some changes, and you just kept going through in this iterative process. Stephanie Egger:	Yeah. Sam Ovens:	That's smart. For people listening to this in the community, don't just stick, if you're doing one thing, and it doesn't work over a decent period of time, don't just think, oh, this doesn't work, and abandon it. Get feedback, iterate it, and get closer to something that is going to work. Stephanie Egger:	I figured that people who are in business are willing to give you feedback when you're asking. Even though, maybe your offer is not something, what they need, they always are open to help. Because, this is in the natural genetic program of people to help each other. If you're just asking politely, if they have any feedback for you, ask for it, and see what's happening. Go for it. Nothing can hurt you. They won't jump through your computer and bite your head off. Sam Ovens:	Of course. That's how you got your third client, and you really, your process for getting clients at this current stage is really direct outreach through a combination of email and LinkedIn, right? Stephanie Egger:	Yeah, and getting back to contacts with whom I have worked already in the past, or in my normal business, or when I was employed. They're like, I could close a deal to deliver a training for 30 days this year still, with a company who is doing training delivery, so this is also pretty cool. Yeah, somehow it's like, from the moment I really decided on my own, my business relationship with myself, being a business woman, and being an entrepreneur, and really deciding that, and crafting my desired character. It was a lot of things, which were hindering me, which were taking me back, somehow just went away, and therefore new things could come to me. This made it really cool. Sam Ovens:	Cool. What would you say has been, you've gone through the program now, and you've been able to get five clients. What would you say has been the most transformational part of the Consulting Accelerator program? Stephanie Egger:	The most transformational part? The understanding of the niche offer. Not to craft it on your desk at home, but really get out and find out what the market is needing, and not because you think it's a good idea. In combination with the mindset and the sales training. What really was a good learning point for me was, practicing the strategy sessions. Because, some of my mind made a connection that I did, I don't know, I did like 10 or 15 practice calls, where either I was practicing with the people, or people were practicing with me. Therefore, my mind got so used to get appointments with people to talk about my service offering, that it didn't made a change anymore, if this was someone with whom I was practicing a strategy session, or if this was someone whom I just wanted to chat about their current situation. This approach, with this practicing the strategy sessions, really tricked my mind into, hey, it's just another strategy session, so there is no need to be afraid of anything. That was really cool, I liked that. Sam Ovens:	Cool, so you really took advantage of that. You did 10, 15 of them, so did you just post in the Facebook group and say, hey, is anyone free to do? Stephanie Egger:	Yeah, or when there was this new joiner post from Nick, I always posted that, hey, if you want to practice, I'm able to do that in English, German, and French, so reach out to me. It was pretty cool, because I'm someone, I love talking to people, and just also to give some feedback, give some advice, and help them grow. Therefore, it's just for me, a great environment. Sam Ovens:	Cool. You actually found someone in the group to practice strategy sessions with in German? Stephanie Egger:	Yeah, I even practiced, I practiced in French and German, and in English. Sam Ovens:	Wow, so that's the power of the group, right? Because, I can't provide that. I don't know how to speak German or French. I don't even know how the strategy session would sound in French or German. Stephanie Egger:	Session de stratégie, or in German it would be like strategy routine, because we in German, we use a lot of English words. Sam Ovens:	Got it. What would you, you've been through the program, and you've seen a lot of other members in the community. What would your number one piece of advice be to them? Stephanie Egger:	It's a numbers game. Do the numbers and get the results, and just start to question yourself only after you have achieved your numbers. Because, if you start questioning yourself already, after 10 outreach emails, because they didn't work, you're screwed. Stick to the process, stick to the numbers, and only judge yourself after you've done it. Sam Ovens:	Cool. What's next for you? Where do you want to take your business to this year? Stephanie Egger:	This year is planned to end somewhere between 780 and 900,000 Swiss francs. I'm far away from that, but there's still nine months to go. I want to hit the 20 millions by 2022. Sam Ovens:	Right now, 18, so that's four years to 20 million. Stephanie Egger:	Yep, that's the plan. Sam Ovens:	You can do it. Awesome. Stephanie Egger:	That's the plan. Sam Ovens:	Well, thanks a lot for jumping on here, and sharing your story with everyone. I'm sure it's gonna help a lot of people. Stephanie Egger:	Thank you. Sam Ovens:	The keys things I got from talking to you was, the first one was when you pick a niche, always pick something that you've got a hunch in. You had a hunch, because you had done that, and that's where you started. Then, you get the rest of the feedback from the market. Then, when you're talking to the market, you can talk to them directly, but also talk to people who know them, to get their opinion about them. Then, work on your mindset, and finally, do the numbers. Make sure you get significant numbers or volume done before judging your performance. Stephanie Egger:	Yep. Sam Ovens:	That's good advice. Well, thanks a lot for sharing with me, and we'll talk again soon. Stephanie Egger:	Terrific, have a good day.